The patient is asked to bare the teeth while the examiner observes for asymmetry. The patient is asked to puff out the cheeks against resistance and then to wrinkle the forehead. It is helpful if the examiner actually demonstrates these maneuvers for the patient. These maneuvers are demonstrated in Figure 21-14. The patient is then asked to close the eyes tightly while the examiner tries to open them. The patient is told to close the eyes as tightly as possible. The examiner can say, ''Don't let me open them.'' This procedure is demonstrated in Figure 21-15A. Each eye is examined separately, and the strengths are compared. Normally the examiner should not be able to open the patient's eyes. The patient in Figure 21-15B had marked weakness of the left orbicu-laris oculi muscle as a result of a stroke involving the facial nucleus. Figure 21-15 Testing the strength of eyelid closure. A, Normal response. Note that the eyelids cannot be opened by the examiner. 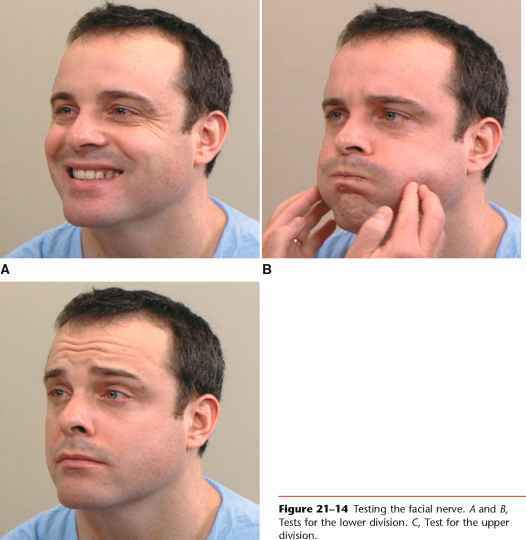 B, Test in a patient with a stroke that involved the facial nerve nucleus. Note the loss in strength of the muscle around the left eye. The innervations of the facial nerve are illustrated in Figure 21-16. There are two types of facial weakness. Upper motor neuron lesions such as a stroke involving the corticobulbar pathways produce contralateral weakness of the lower face, with normal function of the upper face. The patient is still able to wrinkle the forehead. This is related to the bilateral innervation of the upper face by the corticobulbar fibers. The lower face has only unilateral innervation from contralateral cortical centers. This type of upper motor neuron lesion is illustrated by lesion A in Figure 21-16. The second type of facial weakness produces total involvement of the ipsilateral facial muscles, with no area being spared. This may result from lesions of the nerve as it exits from the skull or from involvement of the facial nucleus in the pons, as illustrated by lesion B in Figure 21-16. When the patient in Figure 21-17 was asked to smile, the right side of his face was drawn to the left. This patient has right facial palsy, also known as right Bell's palsy. Further maneuvers revealed that the entire right side of his face was involved as a result of a lesion affecting the right facial nucleus.